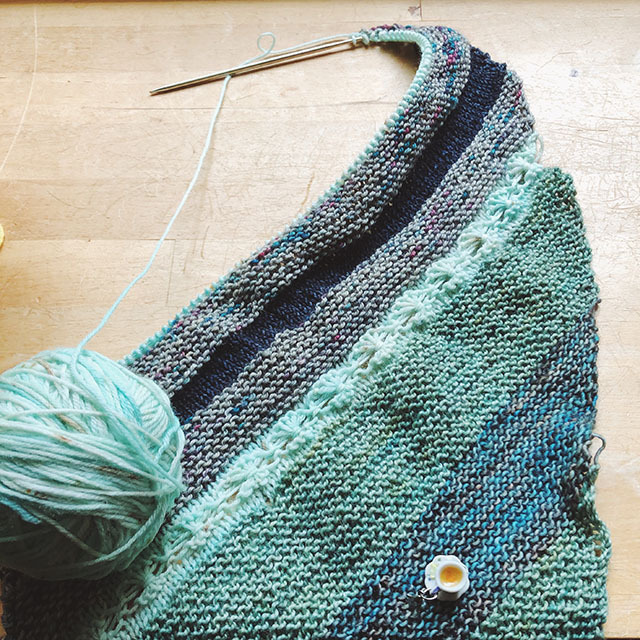 My So- Called Handmade Life: Honk if you like knitting. What's the deal with all the walk-knitting talk? 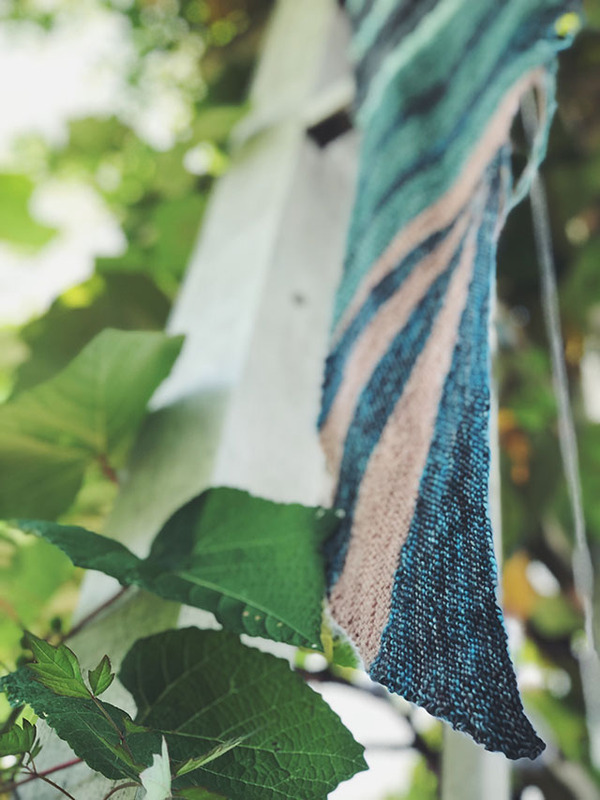 It stems from a recent commitment I made to move more, combined with Cassondra Rizzardi's Mystery Knit-along called Walk The Block MKAL. That KAL began at just the right time to add motivation to my movement endeavor. This commitment isn't to "exercise daily" or even to walk, necessarily. I have always enjoyed getting out for a walk with the dogs in the evening or going on runs, but this is about moving more in between all of that stuff. A couple of years ago, I learned how important it is to not sit for long periods of time after I injured myself lifting and flinging 50 pound bags of soil (a new 4-H/ crossfit hybrid class). The injury wasn't terrible, but it was followed by a time in my life of great stress and lots of driving and sitting around and waiting. It created a deep pain in my hip that became almost unbearable. After my grandfather passed away and my grandmother's affairs seemed settled enough, I took 8 weeks to recover from it. This involved seeing my chiropractor, not riding in a car unless I had to (something about the tilt of the seat really irritated it) and rarely sat on the couch. That's what it took to overcome what began as a simple pull but was facilitated, by sedentarism, into a full blown ordeal. And chiropractic isn't cheap. It is insane how busy a person can be while still being sedentary. I've been reading Move Your DNA, by Katy Bowman, a book that has cemented my understanding of what happened to my body during that stressful time. Since I began the book, I started sitting on the floor, whenever I do sit. She has this great illustration done by an anthropologist of all the ways he had seen various people sit. It gave me the idea to vary my positioning every few minutes. I'm also stretching a lot while sitting and knitting on the floor. You ask if it's helping? Well, I had really tight adductors in one leg since that aforementioned injury. After two weeks of floor sitting and stretching only when I knit, I can almost do the splits again. And the muscles of both legs seem equally relaxed. No, I don't do the splits while knitting. That would just be weird. Look, if it weren't for knitting, I probably wouldn't be sitting at all. I'd stay busy standing and moving around to do stuff until I collapsed into my bed. I am that ODed on sitting. Then Cassondra's MKAL started. 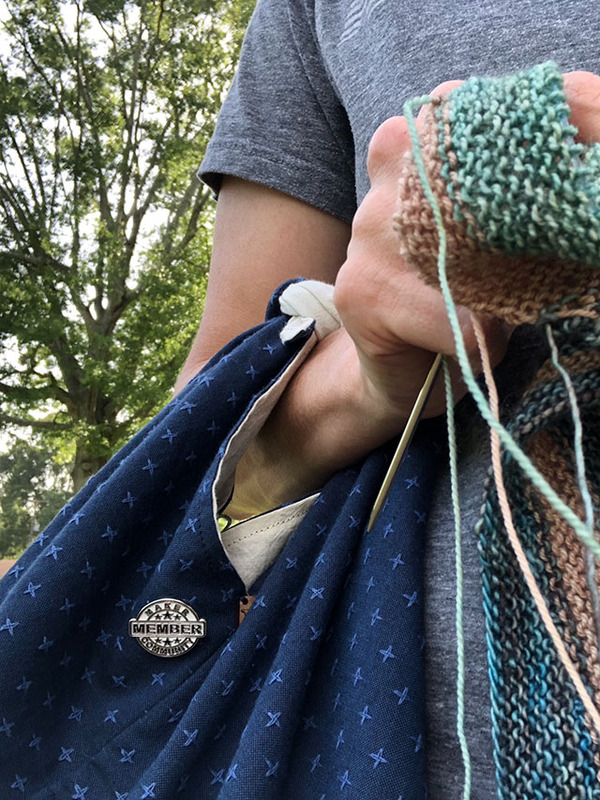 I'd already started standing to knit when, and if, my back felt stiff, but the idea of walking around while doing it seemed like a great way to add variety of movement to my day. But it also seemed like it would be really hard. First, the pattern called for 12 little balls of yarn from my stash. 12 color changes doesn't sound portable to me. Secondly, I live in a place where I have to have my wits about me when walking or running outside. People drive really fast around the curves and everyone has a loose pit bull to guard their crack. I'm kidding. I don't know that it's crack. So, this pattern would have to be pretty easy to memorize if I were to set out walking with it, and that's just what it is. 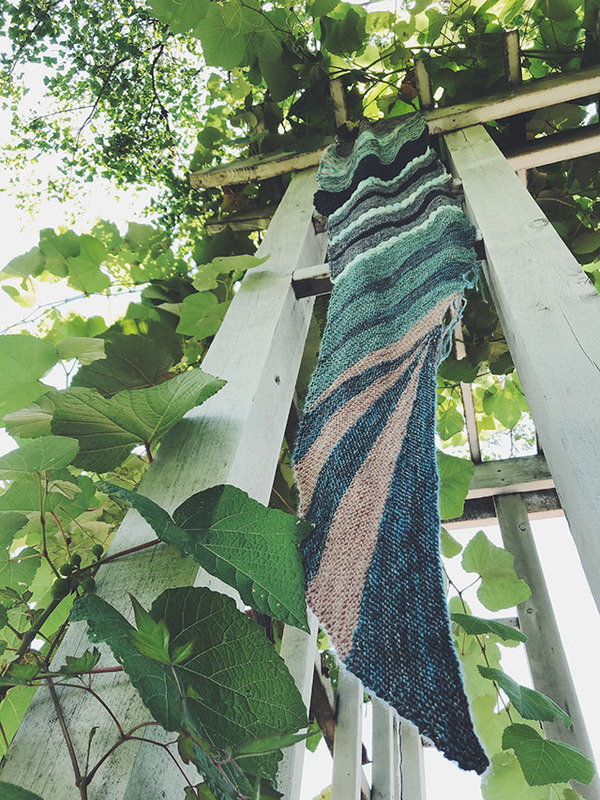 Each section of color involves the same stitch pattern repeated for a time. That time fits perfectly with a nice 45 minute walk. If I remember to alternate the direction in which I turn the project to do each side, the yarn doesn't tangle up with the wrap. Each section only requires one or two of the little balls at a time. So, I can toss them in a wrist handle bag, throw the growing scarf over my shoulder, walk out the door, and make a spectacle of myself. I actually felt kind of inconspicuous. 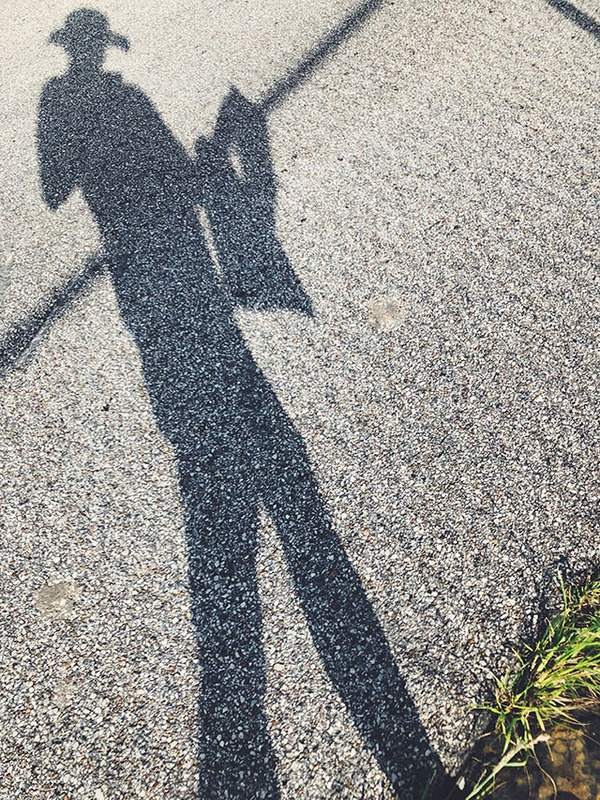 It looked like I was walking with a little purse and I wasn't having to go super slow, either. I was surprised that I got a few honks, since I wasn't even doing the splits, but whatever. 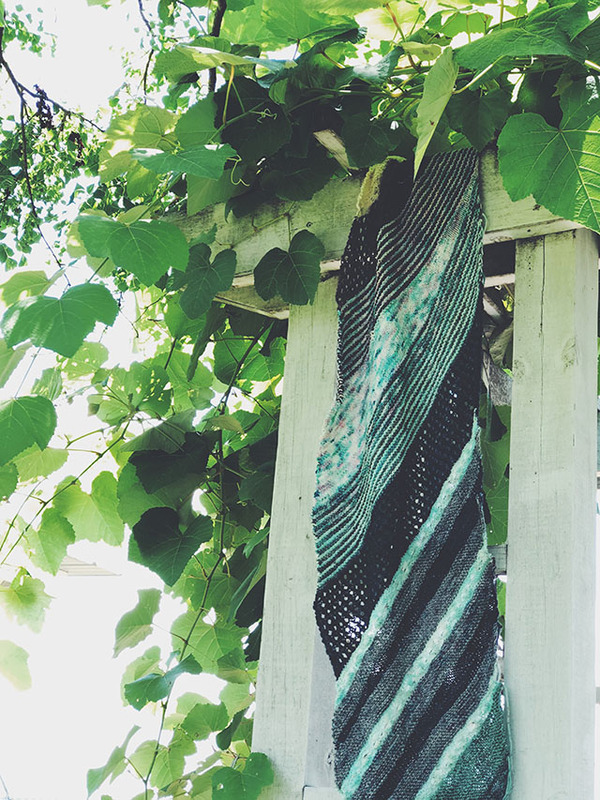 This is a funky little scarf, my friends. It will be a fun wear in the winter.